A game changer of all game changers, these delightful little cookie bites will satisfy anyone’s cravings. Just like Pringles saying, “Once you pop, the fun don’t stop…”Pretty much the same concept with these quick and easy bites, which are also great for on the go. Just be careful because these are highly addictive, I recommend having lots of milk on hand for dunking purposes. Begin to preheat oven to 350 degrees, then in a medium bowl whisk together the dry ingredients. Flour, cornstarch, baking soda and salt (20 seconds) set aside. Incorporate the melted butter and whisk together. With a stand mixer, use the paddle attachment to mix the brown sugar and sugar. Mix in the egg and vanilla; slowly add in all the dry ingredients. 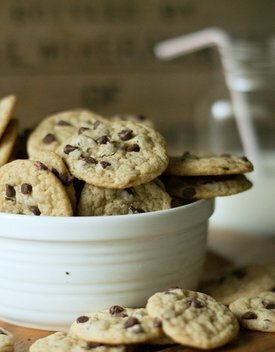 Once all combined add the mini chocolate chips, scoop dough heaping ½ teaspoon. Bake 5-6 minutes, let cool for 5 minutes and ENJOY!